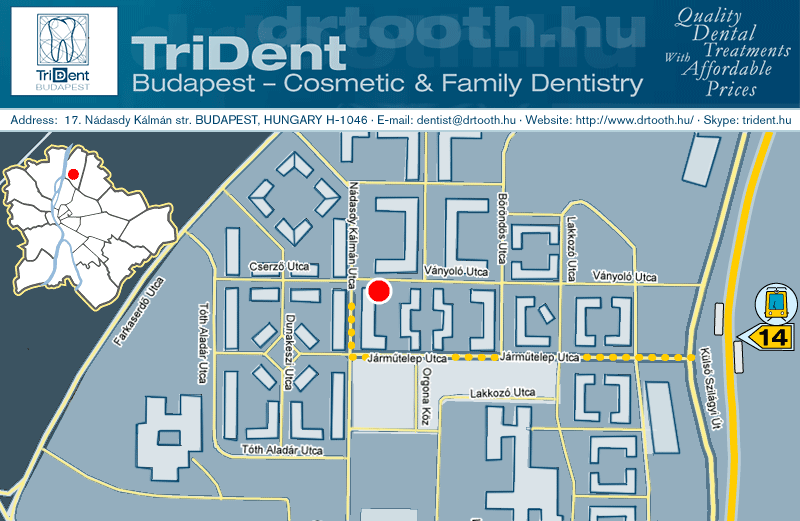 TriDent Budapest's moderate prices are calculated to make quality dental treatments affordable for you. Our pricing is based on Euro. The GBP and USD prices you can see on our website may vary accordig to the current rates of GBP and USD to Euro. All prices are estimates only, patients will be quoted exact prices for their own treatment plan by our dentist (which may be higher or lower than those given above according to the difficulty and complexity of their course of treatment). The guarantee extends only to either fixing the bridge or crown (free of charge) or, if it is needed, to replace it, if the problem is justified and meets the guarantee conditions. In extraordinary cases, we refund the cost of the treatment (with the exception of the cost of materials and technical work fees). TriDent is not liable for any unforeseen root canal treatment after having tooth/teeth prepared for crown & bridgework. Occasionally, teeth suffer preparation trauma during crown & bridgework treatment resulting in a need for a root canal treatment afterwards. The guarantee is only valid if our dentist completes the full work (places the crowns and / or bridges as well). Please note that the guarantee does not cover root canal treatments. The guarantee does not include travelling and accommodation costs. There is a general sickness occurring that has negative effects on the dental condition (for example diabetes, epilepsy, osteoporosis, condition after irradiation or chemotherapy).